Imagine if your only self-image issue was “bed head”. “Bed head” is what you have when your hair had a bad dream during the night and it won’t do anything you want it to. You HAVE to wash it or slather it in product to tame it. If this was my only issue I would be floor-to-ceiling hair gel! But you can’t gel your face. I mean, seriously, I washed my face this morning and can’t do a thing with it. Hell, yes!!!! I would have things moved, smoothed, lifted, removed and added to. I don’t want Botox, though. I like having an overly expressive face. I also don’t think I would have liposuction. Fight Club scared the crap (fat) out of me about where the fat goes. I don’t just have bags under my eyes, I have travel trunks! I don’t have a real double chin but the wattle is a little frightening. Tightening would be nice but then where would the extra go? Behind my ears??? I like my eyes, the shape, anyways. I like my mouth, I can make it almost disappear if I want but some people say it’s pretty big. It’s expressive! I like being expressive. In fact I’ve been told I’m an excessive expressive. Can you make a figure 8 with your mouth? Or sing “Oh Canada” with your eyebrows? I can. Then there’s the migration of the breasts. The joy of having large breasts at an early age is the payback of gravity and breastfeeding. Mammograms don’t help either. Oh, well, if their configuration can’t be helped by a good bra, then my problems are few! I can deal with it but don’t expect to see me in a bra-less halter top. It was hard enough in the ’70’s. But they’re all real!!! Thanks Nana! Enough said! ~ by 1fatgirlshrinking - Diane Kirby on April 17, 2012. OMG! Face fixative! Your poor pores! 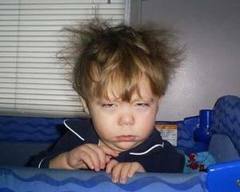 I have ‘bed head’ in the mornings. Husband says I look like a hamster. Plastic surgery – I’m ok with my face, rest of body needs work but no point doing anything until I’ve lost more weight. Unless they can such out 6/7stones of fat?